Kohei Miyadai, a junior at the University of Tokyo, is smart, studious and has aspirations for a career in civil service. But this stereotypical image of undergraduates who managed to enter Japan’s most prestigious university ends when Miyadai fires a 148-kph fastball that catches the corner of home plate. The soft-spoken 21-year-old is the ace of the university’s baseball team. 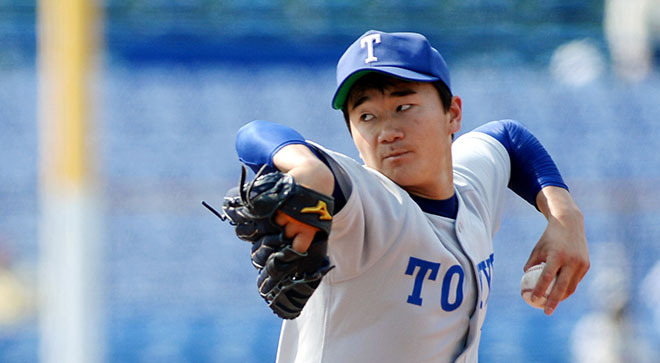 Although the school, also called Todai, is known more for its brains than its brawn, Miyadai’s performance on the mound has drawn the interest of Japanese professional league scouts.Standing 178 centimeters tall and weighing 82 kilograms, the left-hander has been selected to the Samurai Japan collegiate national team for the 40th Japan-USA Collegiate Baseball Championship to be held in three Japanese cities from July 12 to 17. He is the first player picked from Todai since Kensuke Okoshi made the national team in 1983. Okoshi is now an executive reporter of the News Department at Japan Broadcasting Corp. (NHK), Japan’s public broadcaster. Todai had three victories this season for the first time in 12 years in the Tokyo Big6 Baseball League consisting of six prominent universities in the Tokyo area. Miyadai picked up two of those wins. During a loss against Waseda University, Miyadai notched 13 strikeouts, the highest total in the team’s 98-year history. “I feel good when I strike out batters who came from strong high school baseball teams,” Miyadai said.